Is Cowboys' Jason Garrett starting to sour on QB Dak Prescott? Dallas Cowboys head coach Jason Garrett answered a question about his job security during his follow-up press conference after Monday night's 28-14 loss to the Tennessee Titans. It's not surprising, considering Dallas fell to 3-5 this season and lost for the first time at home in this campaign. The Cowboys, who won the NFC East in 2016 with rookies Ezekiel Elliott and Dak Prescott leading the way, haven't been able to get back to that level the last two seasons. It's also not surprising that Garrett, who is composed to the point of seeming robotic at times, handled the query about his job status without a flare up. "I just focus on doing my job as well as I can do it every day," Garrett said. The Cowboys coach has been supportive of quarterback Prescott and his work ethic throughout the past two up-and-down seasons. But Garrett acknowledged that the quarterback's play hurt Dallas at times in the loss to Tennessee. Prescott threw an interception in the Titans' end zone and also lost a fumble in the second half. "He made two poor decisions in the game yesterday on the turnovers," Garrett said. "In each of those cases, you want him to let the play die, live for a third down or punt the ball and go to the next one. Unfortunately, he didn't make those decisions." Until Monday night, Dallas had played well at home, especially on defense. But Tennessee, which entered as one of only three teams that ranked worse than Dallas on offense, moved the ball effectively. Quarterback Marcus Mariota and the Titans converted 11-of-14 third downs on the way to victory. 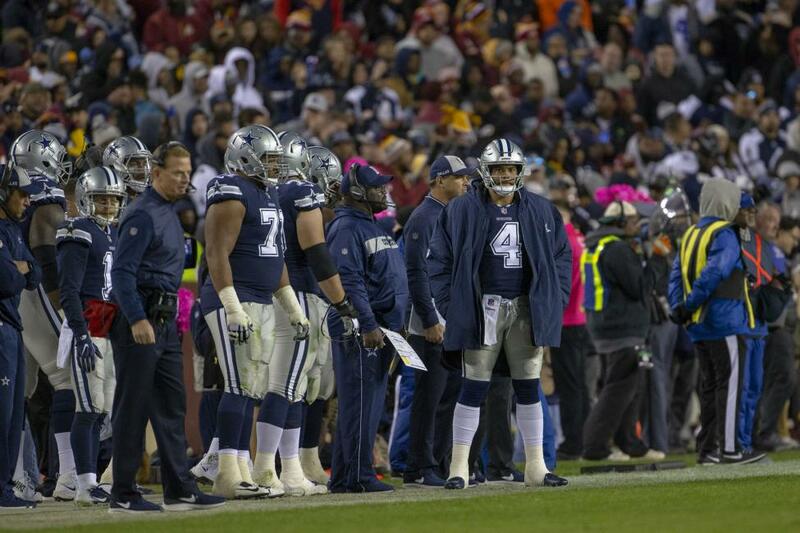 "The defense didn't play well enough in the game," Garrett said. "The situations where we've been pretty good throughout the year that really hurt us last night was third down. Obviously, they kept converting third downs." LG Connor Williams suffered a knee injury against Tennessee. Garrett didn't have much information on the injury on Tuesday, so he declined to speculate on Williams' availability nor who would replace him if he can't play at Philadelphia. RB Ezekiel Elliott started off fast against Tennessee, catching a 37-yard pass in the first quarter that set up a touchdown. He finished with 61 rushing yards and 51 receiving on 21 total touches, but it wasn't enough to ignite the Cowboys' offense. QB Dak Prescott completed 21-of-31 passes for 243 yards with two touchdowns. Those seem like the numbers of an efficient offensive game, especially since Dallas benefitted from two fumble recoveries on the Titans' end of the field. But Prescott had an interception and a fumble that contributed to an overall dud of a night on offense. WR Amari Cooper caught five passes (on eight targets) for 58 yards and a score in his first game as a member of the Cowboys. Prescott looked for him early and often, but the two couldn't connect enough in the second half, when Tennessee shut out Dallas. Sports - U.S. Daily News: Is Cowboys' Jason Garrett starting to sour on QB Dak Prescott?